This month’s mail from Japan showed up on Friday with two premium Tomicas that I’d been waiting for a couple of months now - the Subaru BRZ R&D and the Ferrari Testarossa. Since the Testarossa has been featured already by my brother from across the Palk Strait, Nirmala_L91, I thought I’d let the BRZ out in the wild with its cousin, the WRX STi NBR Challenge. 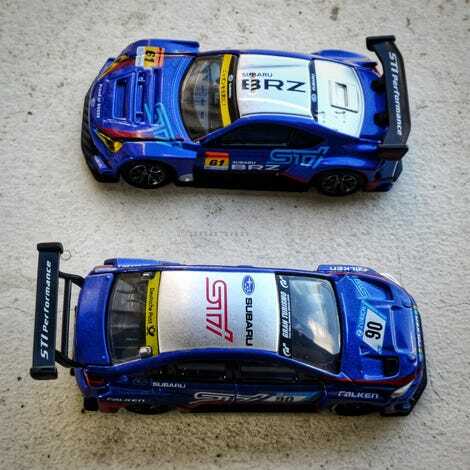 The BRZ is the #61 car run by the R&D Sport team from the Super GT series, while the #90 WRX STi is the car that scored 2 consecutive class wins at the Nurburgring 24 Hours in 2105 and 2016 and was leading the 2017 race until it caught fire 20 hours in to the race. The #90 car returned to the podium this year, scoring another class win, the 5th for Subaru. Both these are rather cool looking models. The STi has a removable wing, but I guess that is more to fit the model in the standard sized Tomica Premium box. At some point, I will take some individual pics of the BRZ and the WRX STi, but today I wanted to post them as a pair.